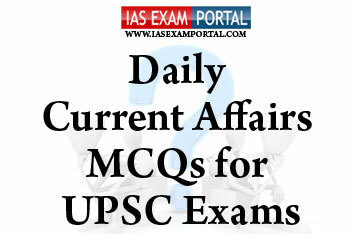 Current Affairs MCQ for UPSC Exams - 02 FEBRUARY 2019 | IAS EXAM PORTAL - India's Largest Community for UPSC Exam Aspirants. Q3. Which of the following statements include the provisions of VISION-30 document potrayed by the government in the interim budget 2019 ? 2) To make India pollution free by focusing on Electrical Vehicles and renewables. 3) Rural industrialisation using modern technologies to generate massive employment. 4) Clean rivers, with safe drinking water to all Indians and efficient use of water in irrigation using micro-irrigation techniques. Q4. Which of the following statements regarding Polar Vortex are true ? 1) The polar vortex is a large area of low pressure and cold air surrounding the Earth's North and South poles. The term vortex refers to the counter-clockwise flow of air that helps keep the colder air close to the poles. 3) Polar vortex phenomenon emerged only after the rapid industrialisation occurred in the last century leading to high greenhouse effects. Q5. The Atlantic Meridional Overturning Circulation (AMOC) , One of the key drivers of the world’s climate is an area in the North Atlantic Ocean, where warmer and colder water mix and swirl was found near which of the following ocean currents recently ?